We’re taking local to a whole new level at Project Open Hand! We have built an indoor greenhouse – a “Room to Grow” – in our building in San Francisco. We’re growing herbs and greens most used by our chefs in client meals, advancing our efforts to provide our clients with the freshest, healthiest food possible, while continuing our commitment to source our ingredients as locally as possible. Interested in joining for our next greenhouse tour? Email Hannah at [email protected] to be added to our invite list. Since our first seedlings were planted in October 2013, we’ve had many solid harvests of both basil and lettuce, and we harvested our first micro-greens in March. We’re delighted that the greenhouse has generated so many wonderful questions. Here are some of the most frequent questions, with answers. Have a question about our greenhouse that’s not included here? Email us at [email protected]. 1. What are the big wheels with lights? The big wheels in our greenhouse are hydroponic systems called Volksgardens, which are produced by Omega Garden, a Canadian company. So far, we have four Volksgardens in our greenhouse. The Volksgarden® utilizes a rotating cylinder housing the plants arranged around the light at the center. The result is highly effective use of lumens, water, and nutrients. As a result, we have a garden that grows fast, strong, and healthy through each season of the year. 2. What kinds of veggies are you able to grow? The Volksgardens are able to grow a wide variety of edible plants. To maximize our yields, we are focusing on leafy green plants (instead of flowering/fruiting plants). In February, we grew Red Sails Leaf Lettuce, Freckles Romaine Lettuce, basil and micro greens. 3. What kinds of yields are you getting? Each Volksgarden unit allows us to grow 80 plants at once. 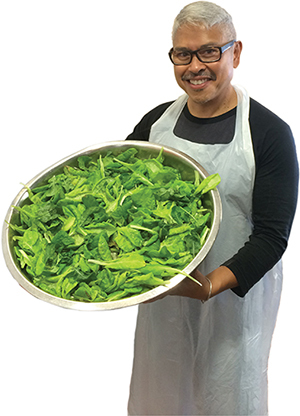 Since planting in October 2013, we’ve had four solid harvests of both basil and lettuce, which we have used in client meals, as well as in salads in our volunteer and staff lunchroom. One wheel-full of basil provides enough leafy greens for sauce used in 1,400 meals. 4. How long is the growth cycle? From seeds, it takes six to seven weeks to harvest. We also have smaller harvests as plants are trimmed or thinned. 5. Did you have to set-up a separate ventilation system inside the room? We’re ventilating the greenhouse using two fans that feed into ducts overhead. The reason that we need to keep the air moving is that the plants in our indoor greenhouse would use up all the carbon dioxide (a big part of their life cycle) in the room in 5 minutes! In addition, the ventilation draws away heat that is generated by the powerful lights in the Volksgardens. 6. Did you have to set-up a special electrical system to power the wheels or are you able to just plug them into a wall socket? The lights run on 220 volt plugs, everything else is standard. The lights are convertible to 110 volts, but 220 is a good bit more energy efficient. 7. What kind of lights are you using in the wheels? In the wheels, we are using 600-watt Metal Halide bulbs. Their spectrum is 6500 Kelvins, similar to the sun on a slightly overcast day. We use high-efficiency fluorescent bulbs for sprouting seeds and growing micro-greens. Each of these fixtures is 54 watts and generates the same 6500 Kelvins. 8. How do you feed the plants you are growing? We are using a hydroponic system. The fertilizer is General Organics BioThrive Grow 4-3-3, supplemented with General Organics Calcium Magnesium and a Probiotic called Big Time Roots that keeps the biome of the fertilizer solution healthy. This solution is changed out weekly and the partially spent solution is put on trees outside our building and used to feed plants around our building. Make a donation – For every $25 donated, we’ll be able to start 50 new seedlings. Donate now. Read about Project Open Hand’s other efforts to green our organization.